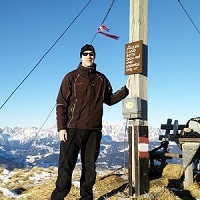 Hiking and mountaineering often bring unexpected challenges, and therefore it is essential that you do not only have the required skills but also high-quality hiking gear. A pair of top-notch socks is one of the most important pieces of hiking gear as it keeps your feet warm, dry and blister-free. There are many types of hiking socks available – such as Merino socks, Thermolite socks etc. 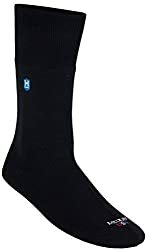 The latest invention are waterproof hiking socks which feature a membrane that is resistant to penetration of water from the outside but allows vapor to pass through from the inside to the outside. You might ask yourself why you would need waterproof socks – the answer is that at some point even the most sophisticated waterproof hiking boots leak if the weather is bad and therefore it is good to have a backup that will mitigate the risk of getting blisters from having wet feet (not to mention how cold and uncomfortable it would be). There is also a chance that water/snow leaks into your otherwise waterproof boots from the top down (if you are not wearing gaiters) or that you are simply not wearing sufficiently waterproof boots. All in all, you might be very happy to have a pair of waterproof socks in your backpack for such situations; hiking does not get much more uncomfortable than when you are a long way from home with cold wet feet, prone to blisters. However, it is important to note that waterproof socks might not be your first choice to wear on every hike as they do not offer the same breathability as ordinary socks. Unfortunately, there is always a tradeoff between water-resistance and breathability; the more water-resistant the fabric is, the less breathability it will offer. Nevertheless, by using cutting-edge materials manufacturers can today produce very water-resistant fabrics that also offer good breathability. 1. Buying Waterproof Socks – What is important? Waterproof socks are usually made of three layers. The outer layer protects the sock against abrasion from the boot while the inner layer provides comfort, insulation and wicks the sweat away from the feet. A membrane in between these two layers allows perspiration to pass to the outside while preventing outside water from reaching your skin. The outer layer is usually made of durable nylon while the inner layer utilizes Merino wool, Bamboo or other comfortable materials. They normally use hydrophilic nonporous PU membranes which are less stiff than porous ePTFE membranes. The PU membrane transports perspiration to the outside via solid state diffusion (e.g. 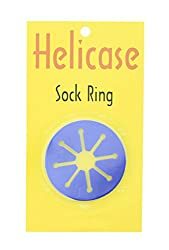 the water molecules pass through because of the higher temperature and humidity inside the sock, seeking equilibrium). For more information about waterproof/breathable fabrics read our article Comparison of Shell Materials. Waterproof socks should be made of materials which are waterproof and breathable. Waterproofness is measured by hydrostatic head and the breathability is measured with MVTR (Moisture Vapor Transmission Rate). The higher these numbers are, the better. Learn more about these two metrics in our article Hydrostatic Head and Breathability (MVTR). Waterproof socks are a bit thicker than ordinary socks due to 3-layer construction. Therefore, it is essential that they are stretchy to fit snugly. 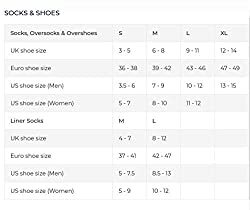 All listed socks in this selection are known for great fit. Inner Layer Material 40% Merino wool, 40% Anti-pilling Acrylic, 20% Nylon Hanz Wicking Liner 41% Merino Wool, 41% Acrylic, 14% Polyester, 2% Nylon, 2% Elastane 35% Merino Wool, 23% Polyester, 36% Acrylic, 3% Nylon, 4% Elastane 70% Bamboo Rayon (viscose), 30% Nylon. The Dexshell Hytherm Pro is a pair of high-quality waterproof socks that will keep your feet dry and warm in the most rigorous conditions. The outer layer is made of abrasion-resistant nylon and elastane, thus providing not only great durability but also a perfect fit. The inner layer is made of Merino wool, acrylic and nylon. Merino wool provides cushioning, odor-control and comfort. Furthermore, it is also extremely pleasant and soft to the touch. Acrylic and nylon make the inner layer durable and quick-drying. Between the inner and the outer layer, the socks have a Porelle hydrophilic membrane which protects your feet against water, snow and wind but at the same time offers good breathability. Additionally, the socks have elastic insteps for better fit. The Dexshell Hytherm Pro are great for those who want to keep their feet dry and warm while enjoying outdoor activities in extremely wet conditions. The Hanz All Season Mid-Calf socks are perfect for outdoor enthusiasts who want to keep their feet dry in extremely wet environments. The socks are equipped with an outer layer made of nylon, Lycra and Spandex. Nylon ensures the durability of the socks and dries quickly. Lycra and Spandex are added to enhance stretch for a good fit. The inner layer is the Hanz Wicking Liner which provides warmth and efficiently wicks the sweat away from the feet to the outer layer. Between those two layers the socks have a stretchable MVT (Moisture Vapor Transfer) membrane which allows perspiration to escape but prevents water from coming in. The socks also have a seamless construction which prevents chafing and blistering. The Hanz All Season Mid-Calf socks are perfect for outdoor and everyday activities in wet conditions. 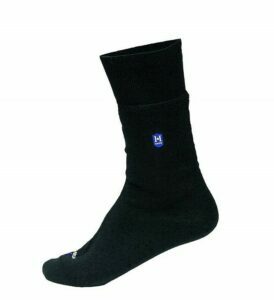 The SealSkinz Trekking Thick Mid is one of the best-selling socks from the British manufacturer. SealSkinz was a pioneer in introducing waterproof socks and therefore we expect nothing less than top-quality products from them. 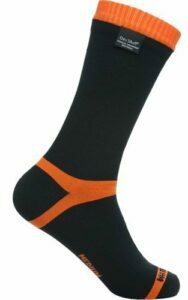 The Trekking Thick Mid socks are equipped with a durable outer layer which is made of nylon and elastane. The inner layer has a 41 % Merino wool content and thus provides comfort, moisture-control and odor-control. The thin and flexible hydrophilic membrane does not cause any discomfort and efficiently protects the feet against water and wind. All SealSkinz garments are equipped with a hydrophilic membrane that has a hydrostatic head of 10.000 mm. The socks also have elastic ankles and insteps which ensure great fit. They come in four different colors. 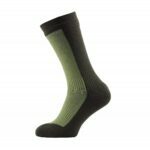 The SealSkinz Trekking Thick Mid are great socks for everyday adventures as well as for longer trips. The SealSkinz Hiking Mid Mid socks are a little less warm than the SealSkinz Trekking Thick Mid above, but they are also more stretchy. Otherwise the socks offer similar functionality– the SealSkinz Hiking Mid Mid are equipped with a hydrophilic membrane which has a hydrostatic head of 10.000 mm, elastic insteps and elastic ankles. These waterproof socks are perfect for hiking, trail running and similar activities where you don’t want to wear too thick and heavy socks. 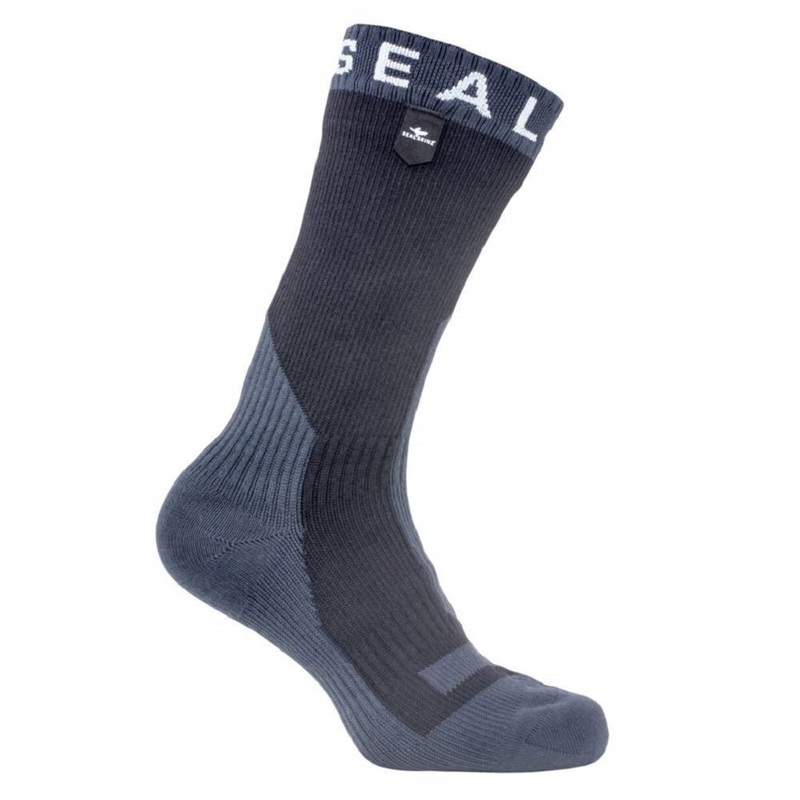 They too are one of the best-selling products from Sealskinz. 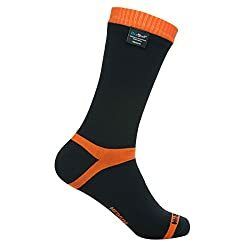 The Dexshell Waterproof Ultralite Bamboo socks differ from the SealSkinz Thin Mid Length, SealSkinz Mid Weight Mid Length and Dexshell Hytherm Pro Waterproof socks by not having a Merino wool inner layer. Instead the inner layer uses eco-friendly Bamboo fibers. Bamboo fibers are a great alternative to Merino wool because they are less expensive, softer and tougher. The only downside is that they do not provide as good odor-control as Merino wool. Otherwise the socks have the same membrane and outer layer as the Dexshell Hytherm Pro Waterproof socks. 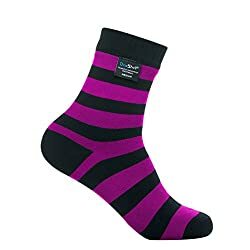 Because these socks are one of the thinnest socks in this review, they are perfect for everyday use, walking and similar activities. Are waterproof socks any good? Waterproof socks are quite good at blocking the water from the outside, but they are not as breathable as ordinary socks. Therefore, we recommend wearing waterproof socks only on adventures that require them – such as hiking, trekking and backpacking in very wet conditions. Do you wear socks under SealSkinz? No, typically you don’t wear socks under SealSkinz as SealSkinz socks are designed to be worn directly next to the skin. They are made of 3-layers and the inner layer is moisture-wicking, quick-drying and odor-resistant. What are waterproof socks made of? Waterproof socks utilize PU membranes which block water form the outside but let vapor to escape from the inside to the outside. PU membranes are stretchy for good fit.